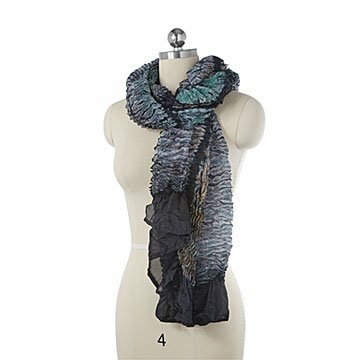 Indian artisans use a traditional shibori dyeing technique and hand-pleating to make these shimmery scarves. Meet tie-dye's sophisticated big sister, shibori. She's a centuries-old Japanese coloring technique, and she's stunning. Her enchanting patterns and and rippling color gradients take this silk scarf from soft and pretty to simply striking. To add another level of charm to each expertly dyed piece, Hemangini Singh and her team hand-pleat the fabric to give it a unique bunched texture. The combination of transcendental grays, blues, and greens and the shimmering effect created as light hits the gathered material make this shibori selection one you'll want to introduce to all of your favorite outfits. Handmade in India.